Shelbie is yet another victim of a bad economy. Life was good for Shelbie. 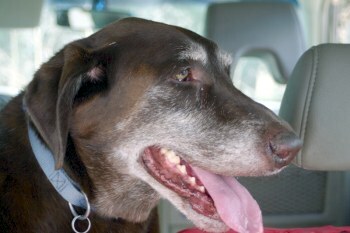 She got to take rides in the family SUV, she got to go swimming and she was taken on long, daily walks. But all of that changed very suddenly when Shelbie’s family lost their home. They surrendered her to the local shelter and waved goodbye. Shelbie patiently waited for them to return and take her for a ride home. She was a good dog at the shelter. She was friendly and outgoing and got along well with the other dogs. But that didn’t seem to matter. No one was interested in adopting Shelbie and her time had run out. 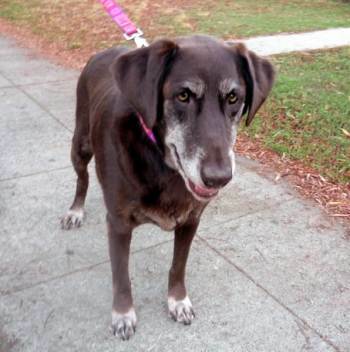 Then, luckily, Shelbie caught the attention of Lab Rescue and she was saved. Whew, that was a close call! Shelbie is just a love! 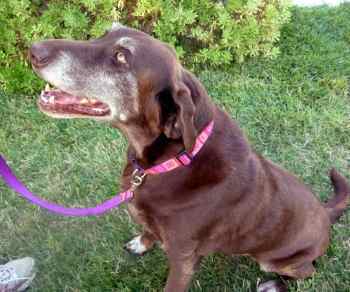 She has a sweet, mellow disposition, has the wagging tail of the typical Lab and she stands ready to smother you with kisses – just let her know when you are ready. Shelbie likes to be near her humans. She will follow you all through the house while you complete your myriad of tasks – take your time, no hurry. And when you are finally finished, Shelbie will lie at your side, content to keep you company while you get busy on the desk work. If you enjoy long walks at dusk, in the companionship of a lovely lady, Shelbie is the girl for you! If you are looking for a devoted soul mate, Shelbie is the girl for you! If you are looking for unconditional love and commitment, Shelbie is the girl for you! If you are looking to share your golden years with a dog that has a heart of gold, Shelbie is the girl for you! Shelbie nicely shares her space with other dogs, cats and humans. Shelbie is patient and tolerant of them all. And Shelbie is very well mannered. Yes, she is house trained, knows and offers a sit, has a very soft mouth and walks nicely on the leash. Shelbie’s adoption donation is $300 and includes her spay procedure, microchip and registration, DHLPP, de-flea and de-worm medications and heartworm (negative) test.